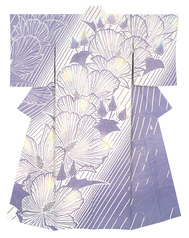 Yuzen-zome is one of Japan's best-known traditional dyeing processes. 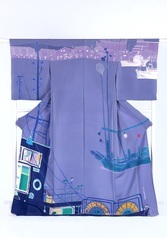 It involves drawing designs on white fabric with paste and dyeing it multiple colors. 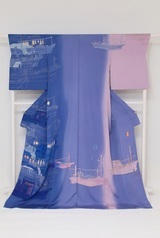 After the fabric has been cut into a kimono shape, an underpainting is drawn in a dye called aobana-eki (blue flower liquid) that washes out without leaving a trace. Thread paste is then applied over the lines of the underpainting, creating masked-off lines that prevent color from mixing. Then, the areas of color are filled in. Finally the paste is washed out. 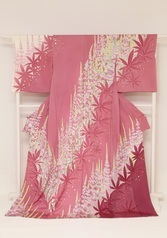 In the style known as itome-yuzen it leaves fine white lines where it had been, while in sekidashi-yuzen the entirety of the fabric is dyed so that no white lines remain. 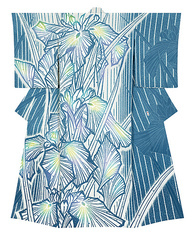 In itome-yuzen, the fixative used to create resists (lines that are not dyed) is called itome-nori (thread paste), and is made from the flour of glutinous rice and ordinary rice. When the paste is washed out of the fabric, it leaves behind white lines that make the design stand out crisply. 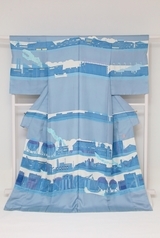 (4) Steam the fabric to make the color take hold. Wash it, and you're done!